Another Time - Where variety is the spice of life and vintage variety is the good stuff that shakes it all up! 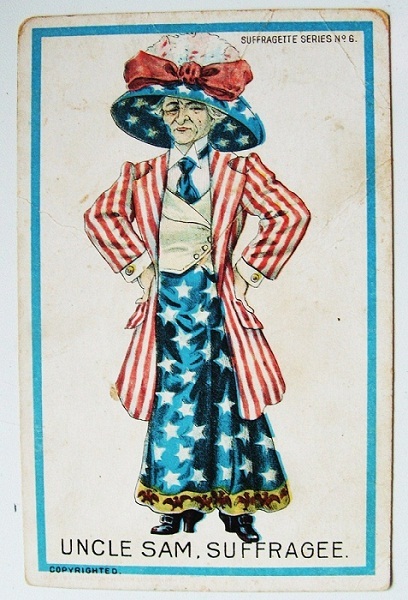 Woman Suffrage Leaflet Published Monthly at the Office of the Woman's Journal, Boston Mass. 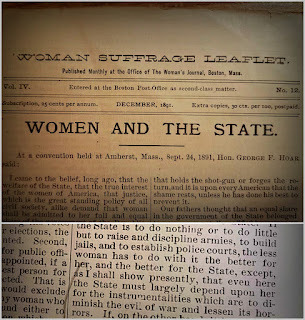 "Women and The State" is the title of the speech given by Hon. George F Hoar at a convention in Amherst Mass on Sept 24, 1891. The paragraph that follows seems to capture the feeling today as more and more American female citizens are running for public office. 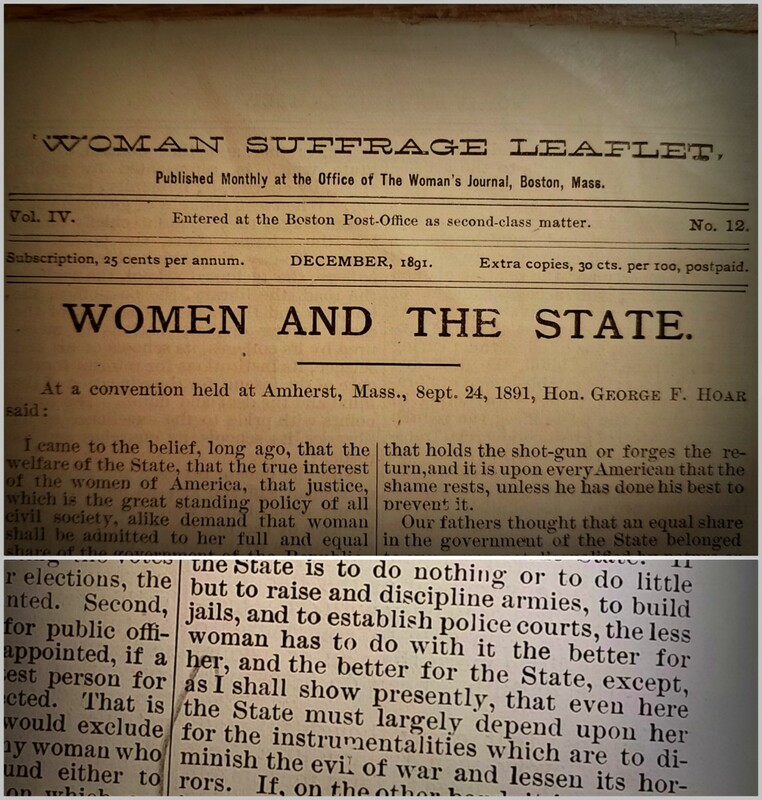 Now the debate between the advocates of woman suffrage and its opponents is, to my mind, but a contest between two theories of the function of the State. If the State is to do nothing or to do little but to raise and discipline armies, to build jails and to establish police courts, the less woman has to do with it the better for her, and the better for the State, except, as I shall show presently, that even here the State must largely depend upon her for the instrumentalities which are to diminish the evil of war and less its horrors. If on the other hand, it is so to use its forces as to put an end to these things; if education, justice, science, art, charity, the promotion of commerce and manufacture, the healing of diseases, the promoting everywhere increased reverence for the individual soul, be a function to which its great forces are to be devoted in the future, then it is indispensable that woman should have in its management her full and equal share. VOTE - like your country depends on it! I love the commercials that Samuel Jackson does for the credit card company where he always ends with "What's in your wallet?" I often think of that phrase when it comes to antiquing: what's in your closet? A lot of "experts" would like you to think that what's in your closet is unnecessary junk and the stuff needs to get thrown out. While there is certainly a small train of thought for that idea, perhaps the better phrase would be to give it some new energy and get it flowing! That's what the world of working in antiques has taught me most: keep the flow going. As a student of metaphysical teachings, I've come to learn that the larger picture can be endless. When the door closes and we clam up, the energy stagnates and ceases. It's not the "stuff" in that closet that's causing the blockage. Rather, it is one's perception of that stuff. What has or has not happened to their own personal energy flow determines how an object is perceived. A keystone can be misinterpreted and become a burden instead. I love working with small bits of "things" because each little thing has a huge story behind it. 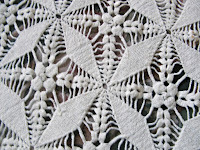 One of my favorite examples is a piece of lace. You can approach it as technical construction and what the object is or you can feel the hands that wrapped those threads together to create something. What was her day like that day? Did she live in simple abode or lushness? Was this a labor of love or a gift to give? A necessary need that could only be fulfilled by making it? Was it a simple act of creating just for pleasure? Made by machine? Where was the factory? Who operated it? What was the town like? 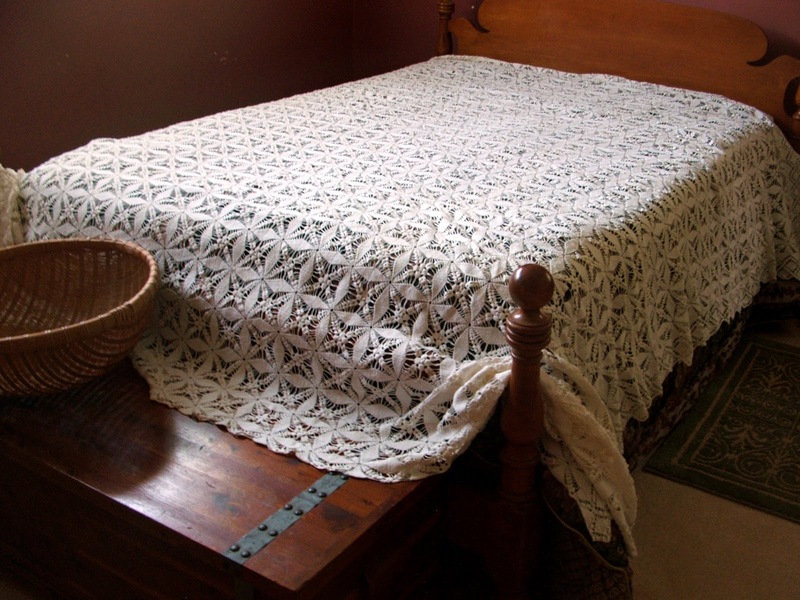 All through the years since the lace was created, how did it eventually wind up in the closet or cedar chest now? Who passed it along? Why did they save this particular piece? What was their life like? Tickling your fancy with questions from the heart can give new life to the plainest of the plain. The process opens the curious mind and energy flows forth again. It is a powerful cycle. Whatever is in that quiet closet, before you think about tossing it away be sure to give it a curious thought. You might be surprised at the riches that flow forth in all their many forms. I have a confession - sometimes I avoid more elaborate pieces of vintage linens because of the time needed to prepare a presentation properly for online showing. Well of course that, in itself, is a silly oxymoron because I remain a true believer that linens are something you just have to experience with your own eyes and hands. As I've been working through my cupboard to get items listed, I came to two treasures for the formal dining table. One is a beautiful Idrian lace tablecloth and napkins set and the second is a lush linen cutwork embroidery tablecloth and napkins set. Both of these are shown fully on separate pages here. (Tabs above). But what I wanted to share here is the flush of memory that came flowing forth as I worked on these linens. After finding my original inventory record from 2006 (THAT was a miracle!) I found myself completely transposed to the dining room of the woman from whom I bought the linens. I can still see that dining room table and chairs full of amazing linens and laces that her Italian mother (and grandmother) brought here and cherished! It was an incredible Awww feeling. Sometimes I truly think we today think we will forever see such treasures, but I'm not so sure. Taking on the responsibility of respectfully handling someone's long time heritage keepsakes is a job I take very seriously. There is love abundant in those threads beginning from the very day they began to be created! Just imagine - those that planned the project ... those that physically created the project ... those that made the initial presentation to give it a home ... to those who purchased, used and loved the pieces ... and on and on it goes! It just makes my head spin with delightful flowing warm energy! There is a connection in family linens that binds the heart. There was so much to purchase from that wonderful elderly lady that day I could not possibly handle the finances all in one swoop and give her the just due she should receive. So, asking for her trust, we made an arrangement that we both would feel complete satisfaction. That was often my practice back in my buying days - and it sure beats credit cards of today! Spending nearly half a day with her helped me to absorb all that was being offered. I remember it so well. So, now I have the pieces presented at Etsy. Take a look at the two pages here with all the photographs. 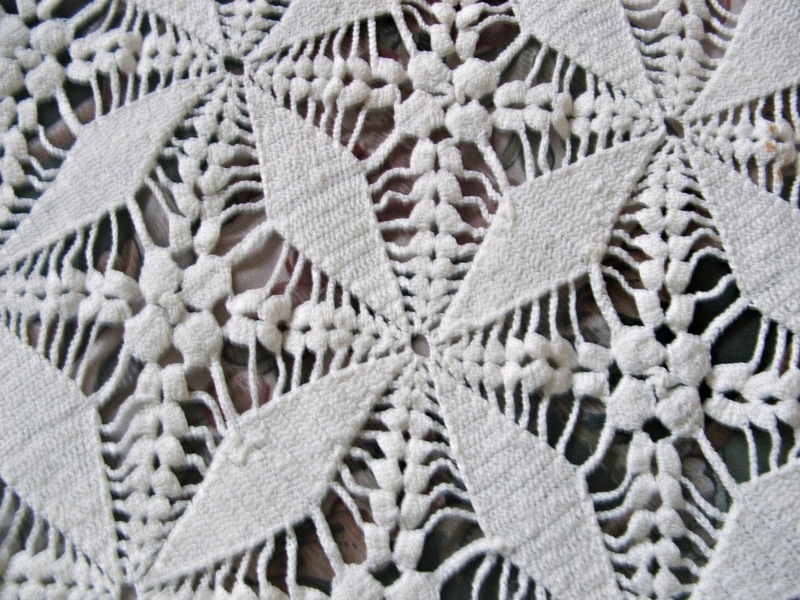 The Idrian lace especially is quite a rare find and lace lovers will enjoy the massiveness of this work! Treat yourself ... you can have a moment in that dining room so many years ago too. The day and make it gloom. I stand in glory’s bloom. 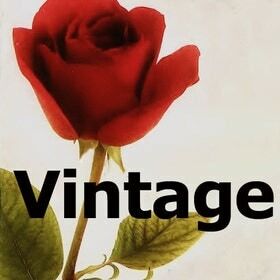 Reduce, Reuse, Recycle... and Wear Vintage! All Contents Copyright 2010-2011 Another Time Antiques. No material to be used without permission. Awesome Inc. theme. Powered by Blogger.